The most effective biological control agent for use against two spotted spider mites. 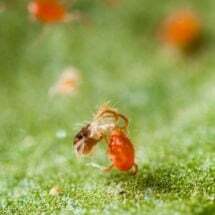 An effective biological control for use against the two spotted spider mite. 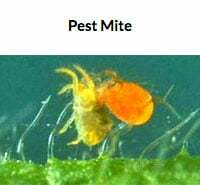 These predacious mites are the carnivorous cousins of leaf-feeding spider mites and other pestilent mites that feed on plants. 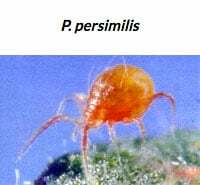 Spider mite predators (Phytoseiulus persimilis) are about the size of a two-spotted spider mite, are orange or tan in color, have no spots, and are shinier and more pear-shaped than their prey. They are also more active and have longer legs than spider mites. 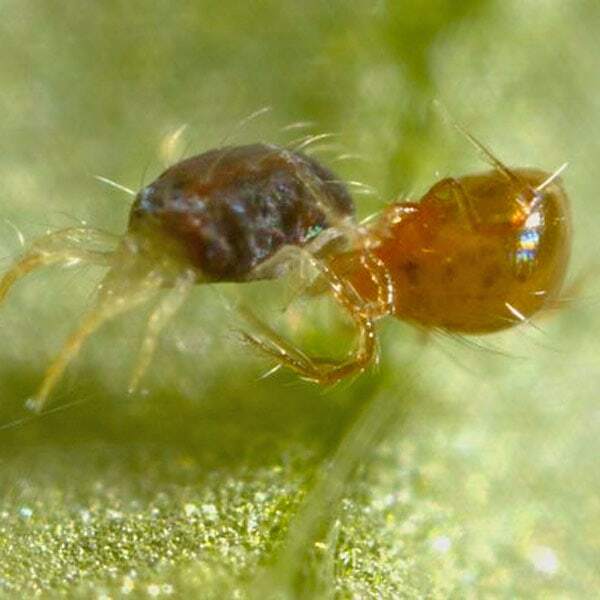 The mouthparts of predatory mites extend in front of their body while pest mite mouthparts extend downward to feed on plants. 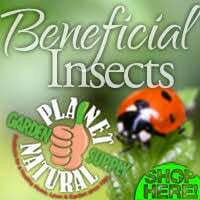 Shop our large selection of biological controls, including mite predators, at Planet Natural. One bottle — 2,000 P. persimilis — treats 700 square feet and costs $59.95 with UPS Express shipping included! 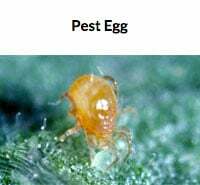 Spider mite predators often occur naturally but seldom in numbers to eliminate large infestations. Their presence is often destroyed by pesticide use or dusty conditions. They are particularly effective when used in greenhouses and indoor gardens. Once distributed in the garden, persimilis take to the underside of leaves where pest mites congregate. Females will lay eggs that are double the size of plant-eating mites eggs. Eggs hatch within days and go through a six-legged larval stage and two, eight-legged immature nymphal stages before becoming adults. The population of mite predators will continue to increase as long as there is prey. Once they’ve exhausted their food source, they move on or starve. P. persimilis are shipped with corn cob grit or vermiculite to give them some bulk. Gently turn and shake the bottle to mix the contents. Sprinkle the contents evenly over plant leaves and as close to the pest problem as possible. Note: Predaceous mites do not attack insects such as aphids, whiteflies, mealybugs or scale. They are strictly predators of most plant feeding mites and do not injure plants or bite people. Once they run out of food, they simply starve to death.